One of the things I did this weekend was assemble and bind a number of journals – five to be exact – that’ll I’ll be using during the year. I’ve been doing this pre-New Year’s for a few years now, ever since I was gifted with a spiral-binding machine and looking for ways to incorporate it in my life. I’ve bound books for decades – the needle, thread, signatures and bookboard way – and I love doing this. So, in a sense, binding by punching pages and using wire spirals seems a bit of a cop out. Yet I love the lay-flat nature of spiral-bound journals, which I find especially useful for projects entailing frequent jottings and everyday writing. And so I’ve become a great fan of my spiral-bound journals. They aren’t simply blank journals though. They are collections of ephemera, of interesting quotes, bits of poetry, and curious things I’ve printed out; of pictures that intrigue me and cards and notes I’ve received, bits and samples of interesting paper and strange envelopes; an assortment of colors and patterns and words. I gather all these things like a well-trained magpie and simply set them aside, filling a drawer with a paper nest of treasures. Then I spend a delightful few hours and assemble things, more randomly than intentionally, because I truly enjoy seeing what magic and synchronicities will unfold. There is plenty of blank space available to write on, truly allowing them to be used as journals, but what I love most is allowing what words or images are already there to inspire what I write about. It didn’t occur to me until this weekend’s binding session that I’ve come to think of these as inspiration journals. I’ve become quite curious about what inspires each of us, and also how we each uniquely work with that inspiration. I think I’m late in my understanding of how VASTLY different we all are, both in our essence and our processes. In a sense I think I’m talking about something much broader than inspiration though – I feel like I’m teetering on a new understanding of exactly HOW different each one of us truly is. It’s kind of like I’ve stepped it up to another level – to a higher broader perspective, where differences become so much clearer, which makes it all the more exciting, because I also see there are truly no separations at all. It’s all folded back into one, into unity. The balance point of paradox that explodes the mind in fabulously delightful ways. I suspect that doesn’t make a lot of sense. I’ve felt that a lot lately – that I can’t find the words to describe things very cogently. Sometimes I have to keep circling something, looking at it from different angles, looking for connections, finding nexus points, or searching for that obscure footnote or marginalia in an arcane work that hints at what direction I might need to turn in the rabbit hole I’ve fallen down. Only then, after extensive examination and re-examination, do I seem to be able to express myself with greater clarity. I feel like that’s the story of my life right now – I’m in a phase where words haven’t caught up yet. I’ve started claiming making connections as one of my super powers. Not in the mundane sense of introducing people to one another – heaven knows that would require a far more social disposition than I possess. But rather the way all things CAN be connected, a bit like the fascinating 6-degrees-of-separation game. I used believe that everyone could see this the way I did – they just didn’t think it was interesting or worth talking about. But I’ve come to understand lots of people don’t see connections, and I’ve wondered then why it is I do. Frankly, why isn’t really important, and I doubt if it’s even an interesting question to ask. But I think I honed the skill considerably over the years because I don’t ever seem to be able to travel in a straight path. Meander is my middle name. Years ago I was delighted when someone pointed out that this was perhaps a Cancerian trait – that crabs siddle up to things – and I saw that so clearly in myself. I took great relief and comfort in that, making ordinary and normalizing something that always made me feel a bit freakish. But these days, I’m understanding my non-straight path as much more clearly traveling a spiral. I revisit things, and each time I do, I discover something different. Of course, this is what we all do, or at least strive to I think. I don’t believe any of us wants to remain stagnant in our thoughts or understanding. We want to bring what we are in the now moment, the accumulation of all the wisdom and experience we’ve gathered, to the table. That’s the excitement of showing up for our lives. Still, I hold the adeptness of conscious connection with some level of interest and remain curious about it. I think perhaps if I had to somehow support myself with this skill, it might serve me well as a museum/exhibition curator. I like to think I see the world as the most fabulous Wunderkammen or Cabinet of Curiosities, so I would delight in imagining I curate my own personal life as such. Which in a sense is what my inspiration journals are. Seemingly unrelated things that intrigue me and beckon me to dig deeper; to look with fresh eyes; to observe and interact and allow myself to be continually beckoned down this spiraling path, celebrating uniqueness and recognizing the myriad of ways everything is truly connected. Who could ask for more than that? How interesting, Deborah. I’d love to see the inside of your journals. I have a binding machine too and I’ve tried to bind a couple of things but I haven’t quite gotten the hang of making it all even yet. I have to keep trying. Happy New Year to you! Thank you Deborah for sharing this with us. I have drawersful of journals of differing sizes from really tiny (even one from a Christmas cracker) to much larger. Random everything goes into them – thoughts, quotes, notes, doodles – Included in my haul are of course my dream journals. I wonder much about similarities and differences and it amazes me that others don’t seem to think or feel about issues the way that I do; or perhaps they do but I haven’t found out. All good wishes for 2018 Deborah. I look forward to your lovely inspirational and beautiful posts. Beautiful post and thought provoking as ever Deborah. The oneness of us all within our uniqueness is something that has been touching the edges of my thoughts for a while and which we all need constant reminding about. It’s such a fulfilling way of looking at the world – a proper antidote to all the nonsense. I LOVE the Monty Python sketch, and it was delightful to hear it again. Let’s put in an order for more of that kind of madness in the world. Thanks for falling down that rabbit hole and searching it out. Happy New Year! I just wanted to pop in and see how you are doing. It’s been some time. I loved this post. I am sure your journals are gorgeous and so fun! I’ve been taking some time off from writing this last year or so. Your reference to connections feels right for me too. I love that you are considering it from a larger perspective and in a uniquely introverted way. That’s great. Well, happy new year, Deborah! I’m delighted you stopped by to say hi Amy, and I wish you a most wonderful new year. I’ve always thought you were particularly adept at self care, and I suspect your time off from writing has allowed more room for exploration in other areas. Hope you’ve been finding lots of joy and basking in peace as well. 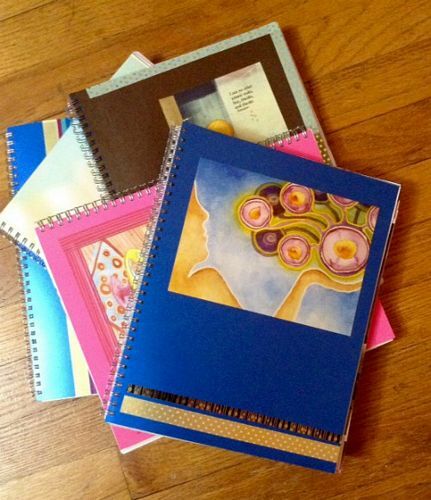 Oh Deborah…As you know, I am a journal lover and maker! And this post is quite thought provoking, because I made a particular journal last year that I just carry around. I thought I was going to gift it to someone, then I just couldn’t part with it. It’s a fantastic, fiber, mixed media journal with tags and pockets, and coffee stained pages, and well, I just haven’t been inspired to write in it…until this post of yours! Thank you for always digging into the heart of the matter, and for sharing your insight into the higher realm of existence that we can all take part in…together! For yes, we are all connected! HAPPY, HEALTHY NEW YEAR TO YOU! I’m so glad you’ve decided to use your journal Vicki – which sounds fabulous by the way. I’ve been thinking a great deal about the things we’re drawn to, and I keep focusing on those wise words “what you are seeking is seeking you.” There’s such richness and deep connection there, and I think understanding that opens the way for great exploration and expansion. Wishing you a most wondrous 2018! To echo others, I would love to see your journals! I love it when traits are normalized for us, when we thought we might be weird, haha. We have the same middle name! Go figure. I too am a meanderer and love how connections happen. Synchronicities all the time, all over the place! I love that! I love what you do for yourself ahead of time for the year. Seems like a very loving thing to do for yourself – and inspirational for all of us. Thank you for another lovely post, and may your new year fill those journals with wonderful, exciting and deep connections! Here’s to a year of wonderful meanderings, delightful connections, and mind-expanding synchronicities. There’s so much magic here for us to appreciate! Happy New Year Deborah! I’ve enjoyed reading these blog posts for the new year and I love seeing these new journals you have created for yourself to use in 2018…what a lovely idea to make special journals for planning, writing and dreaming in! I love reading your thoughts on making connections – many creatives are quit adept at it, yet it is not a skil that is focused on, though it should be, as it is a big part of creative thinking, the kind of thinking that often leads to great discoveries. I look forward to visiting your blog in 2018 and reading your wonderful thoughtful posts! Wishing you a fabulous 2018 Monica – I hope it unfolds with great delights and endless creativity. I love your perspective and I think you’re correct – a big part of creativity IS making connections, and perhaps we should be more encouraging of the development and practice of that skill. I love thinking of it as yet another way we can all do our part to minimize separation consciousness. All the best to you as well Hilary. I think you’re a master dot connector. Given that you’re having an extended stay in a new locale, I’m most definitely looking forward to both your reviews of your surroundings, but also the connections you find to the old. Fascinating!